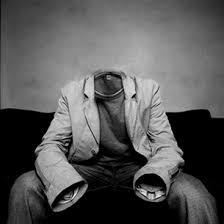 So is the Invisible Man. Then there is that unique species of human being known as the home contractor. I’ve have contractors suddenly become invisible when they were due to show up at my house for all kinds of jobs from simple home repair to painting the house to putting a deck on the back. I’m sure there’s someone somewhere who’s been left waiting at the contractor altar after signing the papers for the guy to put a heliport on the house, build a bowling alley in the basement, or install an ocean in the back yard. Typically I will have met with the contractor about the proposed job for a few hours or more. The contractor explains what’s involved in the job as well as his unique talents for accomplishing it. "What are you, crazy?! Look at me!" "Much better! Unless he later dies of a drug overdose." Mr. Logan certainly seems substantial and creditable. We arrange for him to start work next Monday at 7:00 sharp. But the only people who arrive at my home at 7:00 A.M sharp are the hosts of The CBS Morning Show. Oh, well, he’ll be here, I comfortably think. He’s probably stuck in traffic or having a quick early morning amorous interlude with his wife, or combining the two while driving with his wife to work if he’s so adept. Whatever. None of my business. 11:00 A.M. He ain’t here. Aly Velshi and Stefanie Rule of MSNC are here, but he's not. Mr. Logan is either the last of the Red Hot Lovers or he’s stuck behind a pile up the size of Mt. McKinley. I call his office and get his voicemail. "Hello, this is Logan Painters. We can’t take your call right now as we are out in the field on a job. Please leave a message at the beep." Good to know he’s out in the field. Unfortunately it’s not my field. It's 2 o’clock, 3 o’clock, 4 o’clock - Rock - 5 o’clock, 6 o’clock, 7 o’clock – Rock! We’re still rocking around the clock the next morning at 7:00 o’clock, waiting for the Invisible Mr. Logan. Monday melds into Tues, Tuesday becomes Wednesday and Thursday, and weeks pass, and you realize you have not hired a home contractor at all. You have hired the anti-Michael Avennati. Some say it's because at the last minute the contractor has gotten a better and more lucrative job than yours. If that’s true, do contractors also fail to show up when they have a job rebuilding the Pentagon because at the last minute they get hired to build a new and improved Taj Mahal? Also known as the Home Contractor. And don’t forget, my book Perry Block- Nouveau Old, Formerly Cute is never invisible. (Its sales, though, are something else). I hope you’ll check it out.